i) Exchange of information with the external environment (Subscriber lines or other exchanges) i.e. signaling. All these functions can be provided more efficiently using computer controlled electronic exchange, than by the conventional electromechanical exchanges. This handout describes the basic principals of SPC exchanges and explains how the exchange functions are achieved. In electromechanical switching, the various functions of the exchange are achieved by the operation and release of relays and switch (rotary or crossbar) contacts, under the direction of a Control Sub-System. These contracts are hard – wired in a predetermined way. The exchange dependent data, such as, subscriber’s class of service, translation and routing, combination signaling characteristics, are achieved by hard-ware and logic, by a of relay sets, grouping of same type of lines, strapping on Main or Intermediate Distribution Frame or translation fields, etc. When the data is to be modified, for introduction of a new service, or change in services already available to a subscriber, the hardware change ranging from inconvenient to near impossible, are involved. In an SPC exchange, a processor similar to a general purpose computer, is used to control the functions of the exchange. All the control functions, represented by a series of various instructions, are stored in the memory. Therefore the processor memories hold all exchange-dependent data. such as subscriber date, translation tables, routing and charging information and call records. For each call processing step. e.g. for taking a decision according to class of service, the stored data is referred to, Hence, this concept of switching. The memories are modifiable and the control program can always be rewritten if the behavior or the use of system is to be modified. This imparts and enormous flexibility in overall working of the exchange. Digital computers have the capability of handling many tens of thousands of instructions every second, Hence, in addition to controlling the switching functions the same processor can handle other functions also. The immediate effect of holding both the control programme and the exchange data, in easily alterable memories, is that the administration can become much more responsive to subscriber requirements. both in terms of introducing new services and modifying general services, or in responding to the demands of individual subscriber. For example, to restore service on payment of an overdue bill or to permit change from a dial instrument to a multi frequency sender, simply the appropriate entries in the subscriber data-file are to be amended. This can be done by typing- in simple instructions from a teletypewriter or visual display unit. The ability of the administration to respond rapidly and effectively to subscriber requirements is likely to become increasingly important in the future. The modifications and changes in services which were previously impossible be achieved very simply in SPC exchange, by modifying the stored data suitably. In some cased, subscribers can also be given the facility to modify their own data entries for supplementary services, such as on-demand call transfer, short code, (abbreviated ) dialing, etc. The use of a central processor, also makes possible the connection of local and remote terminals to carry out man-machine dialogue with each exchange. Thus, the maintenance and administrative operations of all the SPC exchanges in a network can be performed from a single centralised place. The processor sends the information on the performance of the network, such as, traffic flow, billing information, faults, to the centre, which carries out remedial measures with the help of commands. Similarly, other modifications in services can also be carried out from the remote centre. This allows a better control on the overall performance of the network. As the processor is capable of performing operations at a very high speed, it has got sufficient time to run routine test programmes to detect faults, automatically. Hence, there is no need to carry out time consuming manual routine tests. In an SPC exchange, all control equipment can be replaced by a single processor. The processor must, therefore, be quite powerful, typically, it must process hundreds of calls per second, in addition to performing other administrative and maintenance tasks. However, totally centralised control has drawbacks. The software for such a central processor will be voluminous, complex, and difficult to develop reliably. Moreover, it is not a good arrangement from the point of view of system security, as the entire system will collapse with the failure of the processor. These difficulties can be overcome by decentralising the control. Some routine functions, such as scanning, signal distributing, marking, which are independent of call processing, can be delegated to auxiliary or peripheral processors. These peripheral units, each with specialised function, are often themselves controlled by a small stored programmes processors, thus reducing the size and complexity at central control level. Since, they have to handle only one function, their programmes are less voluminous and far less subjected to change than those at central. Therefore, the associated programme memory need not be modifiable (generally, semiconductors ROM’s are used). all over the world there is a general similarity between most of the systems in terms of their functional subdivisions. In it’s simplest from. an SPC exchange consists of five main sub-systems, as shown in fig. Terminal equipment, provides on individual basis for each subscriber line and for interexchange trunk. 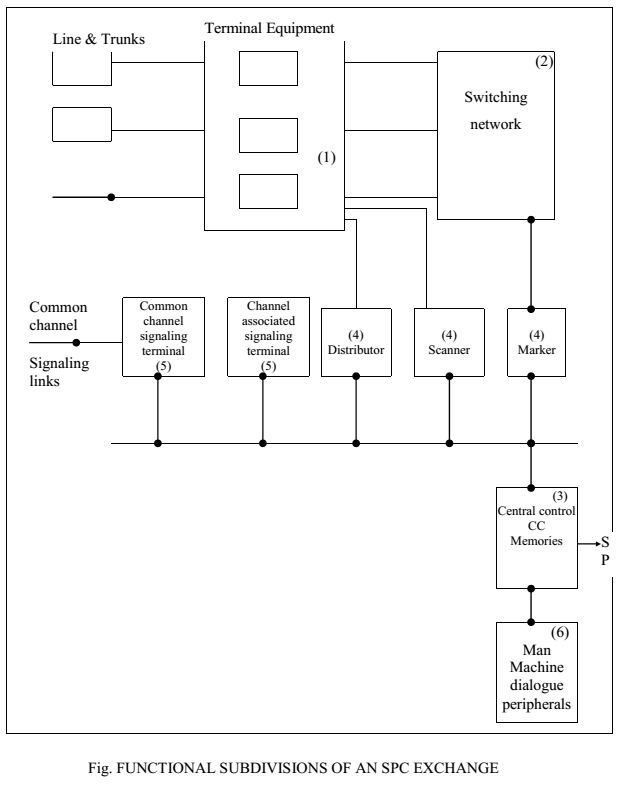 Switching network, may be space- division or time-division, uni-directional or bi-directional. Switching processor, consisting mainly of processors and memories. Switching peripherals ( Scanner, Distributor and Marker ), are Interface Circuits between control system terminal equipment and switching network. Data Processing Peripherals ( Tele – typewriters, Printers, etc. ) for man- machine dialogue for operation and maintenance of the exchange.